Bella Roma. My Tribute to Her! Over a Decade of Fun, Food, Facts and Fumbling Around! Check out Your Fellow Italian Travelers. Email Your Questions and Requests. Dare to Dream! Check the Pix's. Read the Comments. C U in Italy. You made our trip to Rome, absolutely amazing. We cannot thank you enough. It was perfect in every way. Not a bad moment, but a million incredible ones. We saw everything we wanted to see and more than we could have expected. Your pace, your knowledge, your humor all made for a perfect vacation and a lifetime of beautiful memories. The sights,the food, the wine, your friends all incredible. Christine is an absolute delight and very gracious. We had her Limoncello on arrivng home and shared it with our family. Needless to say we loved it and can't thank her enough. Your advice on what to do on leaving Rome was invaluable. We followed it to the letter and had a blast in Orvietto and in Tuscanny. We had a nice long lunch at the place you recommended near the Orvietto Duomo and bought ceramics in the place you told us to. Florence was great and Emma was just unbelievable! I learned an amazing number of things from her that I would never have known. We will recommend you to everyone we know that goes to Rome and we hope to have the opportunity to spend another great time with you in the future, both in Rome and down south. The pictures we took are outstanding overall. Most are really good... I will work on them and get you a set. Anyway, we can't thank you enough. We will never forget this trip and we owe a lot of those memories to you. Thanks!!! PS: Remember to let us know when you are either in Boston or Philadelphia or NYC. 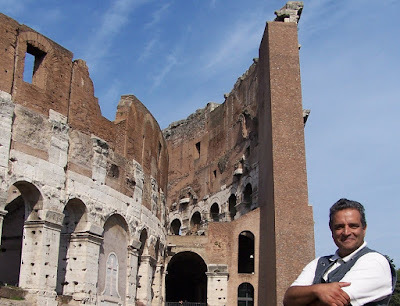 My wife, Avin, and I were fortunate enough on this week that the Colosseum was closed on Wednesday morning, and our tour was delayed till the afternoon – with you as our guide. I just wanted to write and say how much we enjoyed and appreciated our few hours with you, you really brought to life the history Rome and have sparked a new interest for both Avin and I. Our trip was 2 weeks long and covered four cities in Europe, and the three hours with you was my favorite part of our trip, thank you. I’ll be sure to give you a hard time next time the Badgers beat up on the Wolverines! Take care. I just want to say that the Colosseum tour you gave yesterday was simply amazing!! The next time I'm in Rome (hopefully soon) I am definitely going to make sure you're my guide. Thanks again. I have to admit it. When our friends referred you to us, we were skeptical. 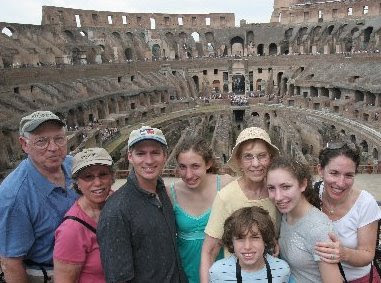 We have traveled Italy countless times and were living there on and off for extended periods. A guide seemed to be an unnecessary expense. We’re still looking at pictures and telling anyone who will listen what a wonderful time we had. When you told our 12 year old you would concentrate on her and ignore the parents, I thought her face would split from smiling. And you did just that. Thank you for "edu-taining" our kid. It is a true gift to make art and archeology interesting to a "tween". Ignore us anytime you want. We appreciate it. Thank you for escorting our US Senate delegation through the Vatican. And thank you for honoring my request and calling me "Chuck". It's nice to have an informed host who suspends ceremony and treats people with casual respect. The people of Caritas thank you for your organizational skills and services to our workshop delegation and visitors. This was the best tour we ever had anywhere. Not just in Italy. Anywhere. You Rock! The military history theme itinerary was a huge success. I look forward to building a "Hanibal" tour with you and sharing it with my fellow battle-field buffs. What a Story! Read this one! We were standing and waiting for our next transfer when a guy came up and asked us about his ticket. We answered and he left. Then I told Michael to go validate our tickets. He walked off and I looked down and MY BACKPACK WAS GONE. It had my white shirts that Brent had gotten me, my purse and wallet, and the real kickers, my PASSPORT CREDIT CARDS and CELL PHONE. Also on the list of important things lost were my only set of car keys, my sudoku books and a bag of ring pops we got from the dollar tree. AHHHH!! I started looking around, but I knew it had been stolen. Understandably I freaked out a little and we talked to the station security who directed us to the police station, down the stairs and to the right. So we went down the stairs and there were a bunch of crossroads at weird angles so we said screw this, we don't want to miss our train, too. So we went back and waited for the train. At the port we were told that I couldn't get on the boat because I didn't have my passport. But, if we got a temporary passport the next day from the embassy in Rome then we could join the cruise at the port in Sicily (Messina) after flying to the airport in Catania then taking a taxi for an hour to the port. Ugh, another freak out (how were we going to do all this by ourselves?!?) and then we walked out to look for a taxi to take us back to Rome. This was where we met Tom Shaker. Michael saw him standing by his van as we walked out. Michael asked if he was a taxi, he looked at us, asked where were going and then shrugged his shoulders and said put your stuff in. Turns out he was just dropping off another honeymoon couple that he had been taking around during the week and wasn't really a taxi, but was willing to take us to Rome because he was heading back there. We told him our story and he took pity on us. He laughed and said it was definitely in his top four horror stories. Then he said let me call some people and he set us up with a hotel at the base of the Colosseum and showed us his friends restaurant that was on that block. He then said he would pick us up in the morning and take us to the embassy, then to the airport. And, even better, he would be at the port next sunday to pick up the other couple so he would take us back to Rome as well!!! Basically this guy was our angel. So we set up in the hotel then saw all of the sights (since we couldn't do anything else). We had a nice, cheap dinner and then talked to our parents and set up everything for the next day. Sure enough, Tom came back the next morning, and getting my temporary passport went flawlessly. We met a couple from New York who had had the woman's purse stolen at dinner the night before and a Chinese-American family who had had all four of their passports stolen out of his backpack. It made me feel a little bit better to stand near a bunch of others who had had their passports stolen too. This morning at the end of the cruise we got off the ship and met up with Tom Shaker and the other honeymoon couple, Megan and Taylor. She loved you, the tour and the lunch. She said you were amazing and was going to send lots of folks your way. You did me proud!! She raved about you for half an hour. I’d love some photos I can send to her if you have them? ?Thank you so much for the wonderful job and for making this such a special trip!! We had a roaring good time - thanks so much for everything!! Will connect with pictures and some future tourists soon. Good luck with the show tonight - we're sorry to miss it! 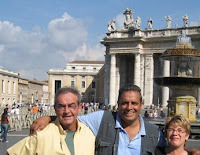 Just wanted to send you a BIG thank you for our tour of the Vatican Museum on 11/8/06. You are a great, knowledgeable and "so entertaining" guide!!! We are the folks from the cruise ship who live in Columbus, Ohio. 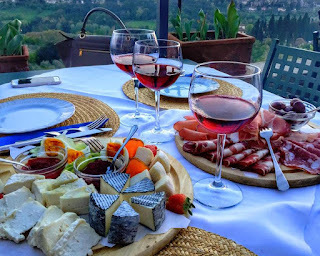 We fell in love with Italy and are hoping to come back and lease a villa for 1-2 weeks for several couples. Any suggestions on how to begin our search? Keep up the good work and let us know about villas. I did get an email from Diane. They had a wonderful time on their trip. Thanks for doing such a great job. It’s rare I get an email back from Europe. She said you were charming. I am back from my vacation and I am just getting to my e-mails when I noticed yours. I was already in Italy and I never saw this e-mail prior to meeting you. It gives me an opportunity to say thanks again for a wonderful tour of your adopted city. My kids are still talking about it. I could almost see the knife going into Julius Caesar’s back and Mussolini posturing to the crowds from his balcony. It was fabulous. Best of luck in your new home. We’ll be watching the film credits for anything filmed in Rome to see if your name is there. 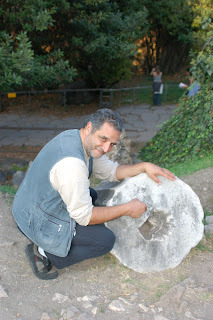 I just wanted to write and tell you our day with Marco to Pompeii, Positano and Vesuvius was AWESOME! Next trip to Italy we are going to plan to take a few more excursions through you. I referred you to my cousin and another friend - both planning on coming to Italy next year! Thanks again! Hey Tom! Thanks, you were great too - we will definitely touch bases with you if we ever return to Rome. We had a great time there! We arrived home safe and sound earlier this afternoon. The flight even arrived a few minutes so the trip back was seamless. I'm sure you wouldn't be surprised to hear that most of us slept for the better part of the flight. What a pleasure to meet you. Mike and I thoroughly enjoyed our trip and your expertise with the tours and transfers certainly made the trip much more enjoyable!!! I will be sure to share your company's sales brochure with my colleagues and recommend your services. Thanks again for your kind hospitality. My husband and I were recently in Rome, and we met you at the Roman Forum. I just wanted to thank you for taking the time to guide us around and explain what everything was. It made the visit so much more meaningful. I had read lots of books on the subject before going, but by the time I got there, I had forgotten much of what I learn. Your stories really made everything make sense. Thank you so much! Several times in Italy, people had tried to take advantage of us or "rip us off" in some way. It was so refreshing that you gave us something of great value and expected nothing in return. You have been highly recommended to me by my partner. Tom is the American guide I told you about. See if he's available for your trip. It will definitely be worth it! 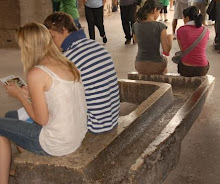 Visitors in Rome flock to many "must see" sites. Two of these locations are the Spanish Steps and Trevi Fountain. Crowds of tourists walk between one and the other, many never realizing that they are passing by an outstanding team of angels sculpted by the baroque master, Gian Lorenzo Bernini. Just south of Piazza di Spagna (and north of Fontana di Trevi) on Via di Sant'Andrea delle Fratte is a church of the same name. Inside, framing the main altar, are two "prototype" marble angels. One of the last and largest projects for an aging Bernini was to replace the deteriorating stucco angels of Raffaello da Montelupo that stood on the bridge that crossed the Tiber, endeding at the entrance of Castel Sant'Angelo. Logically named Ponte Sant'Angelo, this span over the present day Tevere River (Tiber) was to become a showplace for ten Bernini angels, each one depicting a moment in the Passion of the Christ. Not a bad gig for a seventy year old sculptor! In fact, Bernini personally completed only two of the ten (while his assistants worked on the remaining eight). One holds the superscription I.N.R.I., the other delicately grasps the Crown of Thorns. The Pope who commissioned the project, Clement IX, was so fond of these two angels that he kept them for himself! Fortunately for the faithful and the curious, they now reside inside Sant'Andrea delle Fratte. It was normal in the time of the Imperial Papacy that the CEO of the Catholic Church surround himself with riches, materials, accolades and servants. The glory of God was measured in stuff more than sacrament and artists cooperated in order to have the canvas and medium necessary for their creations. Bernini was no exception. The generous sponsorship of the Holy Father gave him resources necessary for creating mammoth masterpieces throughout Rome. Yet, controversy and intrigue swirled around these works as well. Whether or not the elliptical colonnade at St. Peter's pays homage to Galileo's solar system treatise is substance for discussion. And the Ecstasy of Saint Theresa statue in Santa Maria Vittoria clearly begs consideration between the sacred and the profane. The same tenets apply to these angels in Saint Andrew as well. Looking at the two statues, one can only marvel at the power and passion that was Bernini. Bringing something so inanimate as marble to life is a stroke of genius. (In this case, a hammer stroke). But Bernini exceeds this by giving the duo an appearance of human character. The angel holding the I.N.R.I. banner seems to be pious, instructive and focused on the presentational task at hand. The other however is reacting logically to the slightly thorny duty at hand (literally). We empathize with the story of the Passion and contemplate the interpretation etched in metamorphic majesty. Ouch. It hurts to get stuck in the finger by a thorn. This is classic Bernini: a combination of force, piety and just a little pain.